For the third year in a row Hilton Head Island is voted the BEST ISLAND IN THE USA in 2018 by Travel & Leisure. This beautiful home on Fazio Golf Course, 26 Heath Drive Palmetto Dunes, newly renovated, bright nonsmoking, pet free, beach home offers the best of both worlds with a short walk to the beach and excellent views of 2 fairways on the FAZIO GOLF COURSE. Large sunny pool deck and flat screen TV in the lower level screen porch offers room for spacious gatherings. Don't forget to enjoy the Hot Springs Hot Tub with exclusive back massager. Your family and friends will love all the amenities: Heated pool and hot tub, 2 hours of daily tennis/pickle ball, 8 bikes, Kiddy Cart, 2 Kayaks, Ping Pong Table, and Foosball Table. Our home rents Saturday to Saturday, we may have some flexibility during the off season. All house rules must be followed as stated in the rental agreement: No smoking, No pets, renter must be 28 years of age and residing on the property for the week. We will ask you to send us a copy of your photo ID and our house keeper will greet you upon arrival to verify. We want to make your vacation the best it can be. Please let us know if you have any questions or requests. You may never want to leave the back yard or one of the serene screen porches which offers an additional 630 sq. ft. outdoor living space. With soft seating for 8 and 47 inch HD flat screen you can relax watching one of your favorite sporting events or movies. As you enter the vast 2 story foyer this 3 level spacious home offers 3200 square feet of comfortable living. The large living room with 47 inch HD Home theater with wireless Blu-Ray, dinning room and state of the art fully equipped eat-in kitchen (extra frig with ice maker in the garage) provides a great room effect. For all of your entertainment, we have provided you with the Hargray HD Premier package with Showtime, EPIX, and Sports Plus. For those streaming enthusiasts take advantage of the fastest available internet; 30 X 2. Surrounded by cathedral ceilings and paddle fans in all of the previously mentioned rooms the bright airy home is truly a paradise, as you look out onto your own private pool and palm trees and a gorgeous view of hole #2 and 8# in the background. This home is ideal for large group gatherings, with inside dinning seating for 16, and an additional dinning seating for 12 on the hot tub deck and lower screen porch . A large gas grill is provided for easy entertainment. The large decking area around the pool provides sunny seating for 10. The first floor spacious master bedroom has a view of the pool and golf course with it's own entrance to the lower level screen porch. The newly renovated master bath offers a free standing soaking tub, walk in shower and double sink. The first floor guest bedroom has twin beds with a private bath and shower. There is a full bath with tub/shower off the foyer.The spacious guest room on the second floor has cathedral ceilings, 2 queen beds and a private bath with shower. The guest room on the 3rd floor has twin beds and the private bath has a tub/shower. The spacious master bedroom on the top floor has a cathedral ceiling, and windows from floor to ceiling. The newly renovated master bath has a free standing soaking tub, walk in shower and double sinks. Rest and relaxation can be enjoyed as you take in spectacular views of the golf course on your own private screen porch. A great porch for adults to enjoy happy hour with seating for 8. There are 2 portacribs and a high chair in the walk in closet. All of the bedrooms have ceilings fans for your comfort. The laundry room is located just off the kitchen. For added fun and adventure we have 8 adult bikes, kiddy cart, double wagon, large cooler, Foosball and ping pong tables in the garage for your use. Keywords: Large private setting with bright golf course views and wonderful extra amenities, short walk to the beach. We have been vacationing with our family on Hilton Head Island since 1985. Our children have numerous memories of hot summer weeks as well as winter holiday vacations with large family gatherings. Now we are blessed to enjoy all that Hilton Head has to offer with our grandchildren. We hope to spend more time on one of the most beautiful places on the eastern seaboard. It is truly a paradise Island with many great amenities for all ages. For detailed questions please call 4127806126. This is an awesome house, the pictures do not do the house justice. The views of the golf course are spectacular and the back yard is spacious and sunny. Everyone loves the large lower level screen porch with the large flat screen TV. You can watch your favorite sporting event from the pool. The upper level screen porch provides rest and relaxation and great escape from the crowd. Our renters love all the amenities. As soon as you arrive everyone can start their vacation with out delay. Every bedroom has their own bathroom for an enjoyable and comfortable stay for all your friends and family. Our home is located in Palmetto Dunes on the 2ND hole of the George Fazio Golf Course. It is an 8 minute walk or 4 minute bike ride to the beach. We are 13 houses from the end of our quiet street. At the end of the street turn left past 2 houses and take the pedestrian bridge over lagoon. You can access the beach via PD path beside the Omni. The Omni property has an outside cafe and often live Island entertainment to enjoy. We find the Omni amenities to be a huge bonus for food and drinks. If you want to drive to the beach you turn left at the end of our street and follow Queens Folly Rd. to the Disney Beach access which has a snack bar, picnic area, and restrooms. The house has 2 master bedroom suites with king beds and Jacuzzi baths. The upstairs master has its own deck with a view of the golf course and the lower master has glass doors to the main deck where the heated hot tub is located. The large bedroom above the garage has 2 queen beds and its own bath. The other 2 bedrooms each have a set of twin beds with their own baths. There is an additional full bath in the foyer. The view through palm trees off the back deck overlooking the pool is fabulous. It is very entertaining to watch the golfers hit out of the sand traps on hole #2 and approach the green on hole #8. The large great room area has a living room with a fire place and 47 INCH Flat screen HD TV, VCR, & DVD. To add more fun to your vacation we provide: 2 hours of daily tennis/pickle ball, 2 kayaks, 8 bikes, kiddy cart, foosball table and ping pong table, large cooler, beach chairs and umbrellas in the garage. All linens, beach towels, cleaning and taxes are included. This is an unbelievable house. Not only is the interior spectacular but the outside backyard is incredible, with extreme privacy and views. Palmetto Dunes offers miles of big wide sandy beaches, fun for bocci ball, bike riding, kite flying, not to mention world premier golf and tennis/pickle ball throughout the island. The complimentary Palmetto Dunes Buggy provides shuttles rides to the new state of the art Shelter Cove Town Center and Shelter Cove Marina. These two areas provide limitless opportunities for vacation fun for all ages: boating excursions, crabbing, fishing, kayaking, paddle boarding, shopping, dinning, yoga, Pilates, Pure Bar, playgrounds, and beautiful sunsets. The most adventurous way to access this area is the Palmetto Dunes bike path that continues under Rt 278. The new lighted bike paths encourage out door enjoyment day or night. Palmetto Dunes is a world class oceanfront resort, 3 miles of pristine beach, voted top 10 in family resorts in the USA. If you are looking for adventure try kayaking, canoeing, biking, fishing or head to surf camp, play golf on three of the Island’s best courses, play tennis at the world renowned tennis center (ranked 2# in the world) all in Palmetto Dunes. Our General store has a one stop shop for all your vacation needs. You can ride bikes to Shelter Cove and Shelter Town Center for spectacular water front shopping, dining and family entertainment with Shannon Tanner, summertime Tuesday night fireworks. The Marina offers SUPing, Kayaking, fishing excursions and boat rentals. Come and enjoy the sun, fun, peace and quiet, on a Dolphin and Nature Tour. Every bedroom has their own in suite bath as well as additional full bath off the foyer. Palmetto Dunes Resort has been voted number 1 family resort. It offer 3 miles of beautiful sandy beaches, 3 world renowned golf courses and premier tennis and pickle ball courts and the general store. We have wonderful views of the second fairway with fairway sand trap directly in front of our back view. We also have a great view of the 8th fairway and green. Over sized large new frig with cafe doors, and additional frig with ice maker in garage. Dinning table seats 8, kitchen table seats 4 and bar seats 4. Sunny deck over looking pool. 2 Screen porches. Sunny pool area with large seating deck at each end. Wireless Internet, 2 zone air conditioning, 47 inch HD TV Home theater, 7 Televisions, VCRs, DVDs, Fully equipped Kitchen, Second Frig in garage, Water filter in frig, Tennis/Pickle Ball Courts, Private Heated Pool & Hot Tub, 2 Kayaks, 8 adult Bikes, kiddy cart, double wagon, large cooler, Beach Towels, Foosball and Ping Pong tables, Garage Parking, Just bring your beach chairs. Great place!! Has everything you need for vacation. We loved our sunset bike rides on the beach! Hot tub and pool were great to have on cooler evening!! Patty was always available and easy to contact!! What a GREAT Thanksgiving week we spent here at this beautiful home. Our host Patty was everything and more that people described through the reviews. The home was perfectly located as this was our first time visiting Hilton Head. As we all arrived you could just feel how comfortable everyone felt. We have two small grandchildren 18 & 8 months. Having porta-cribs,high chair, booster seat and of course 2 baby bouncers made it so much easier. We also really enjoyed having the bikes already in the garage including one with a child's seat and another with a kiddie cart. I can really go on about this home, the enclosed porches off the two master bedrooms, awesome hot tub, ping pong and fooz ball tables in the garage etc etc. The inside is even better with the kitchen and dining areas being large enough that we never felt on top of each other with 7 adults.The home is very well maintained and very up to date. The bedrooms and bathrooms were large, well done and very very clean. I would highly recommend securing this home if available during your search and meeting your needs, you will not be disappointed.!!! If we decide to travel back to Hilton Head this home will be our choice to return to. Thanks again Patty to you and your family for allowing us to enjoy your home. We rented Patty’s house September 15-22nd for our family vacation. The house is tucked away in Palmetto Dunes on the golf course ... very quiet with a beautiful view of the fairway. Everything you could possibly need is provided .... the bedrooms are large, bedding is great, the kitchen is stocked with everything from pots and pans, silverware, spices and dishes. The favorite part of the home for my grandchildren was the pool! Most of our time in Hilton Head was spent in the pool .... which is heated ... for free! We did take the bikes one day and went to the beach, which is a five minute bike ride away. If you want a great home, in a quiet neighborhood, but is close to everything (restaurants, goody golf, shopping) rent this house. We had a fabulous vacation. Thank you Patty! Your home is awesome! 6 STARS PERFECT PROPERTY AS DESCRIBED. SPOTLESS , EXTREMELY ATTENTIVE OWNER. WOULD HIGHLY RECOMMEND THIS PROPERTY TO ANYONE. THE FOLLOWING WERE ENJOYED: SWIMMING IN THE POOL AND OCEAN, LIGHTHOUSE,MARINA, COFFEE ON THE PORCH ,KAYAKING,GOLFING,BIKING,PING PONG,FUSEBALL,MANY RESTAURANTS AND SOME IN WALKING DISTANCE. SHORT TRIPS TO HISTORIC SAVANNAH, BLUFFTON AND BEAUFORT, INCLUDING PAULA DEAN'S RESTAURANT, THE PICTUESQUE PARK OF FORREST GUMP'S MOVIE .VERY PRIVATE AND SAFE. RELAXING WAS THE BEST PART. This Beautiful House on Fazio has Everything! We've been coming to Hilton Head for 25 years. We've stayed in this house several times and other homes just don't compare to 26 Heath on Fazio in Palmetto! It's beautiful to start with, and the house is always super clean - I mean spotless! The pool is a great size with sun and shade when you need it! The hot tub is great too. The layout is wonderful for one or many families. Lots of bedrooms and the perfect large gathering area on the main floor. The screened in upper deck and first floor patio added in recent years made this already fabulous house even more spectacular. The owner has thought of everything, we've even celebrated Thanksgiving in this house - the kitchen is so fully equipped - something so many owners of large homes overlook. We so appreciate the bikes that come with this house! 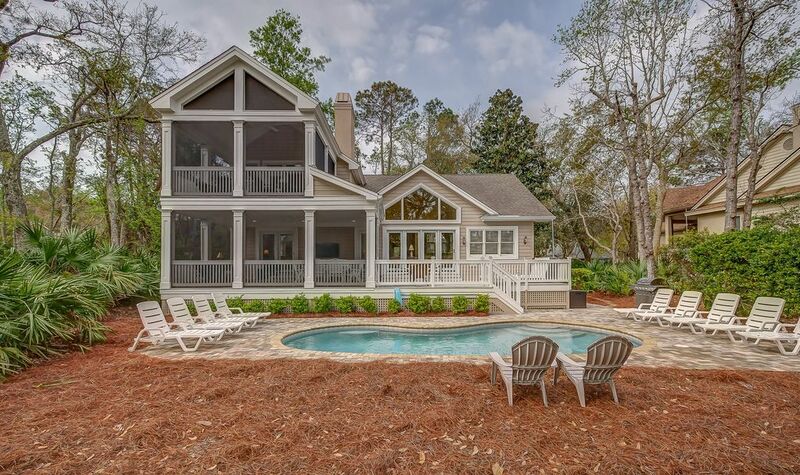 If you're planning a vacation on HHI and this house is available, don't look anywhere else! You'll never match the value. Can't wait to be back! Patty was a great host. First time on the island but overall impression is a good value compared to other properties. Golf: The best way to schedule your golf games is to call the Plametto Dunes Golf reservation number 843-785-1138. When you purchase 3 rounds of golf in advance you will save at least $15.00 per round of golf. Please be sure to inquire about discounted afternoon fees as well. Holiday rates for Easter, Thanksgiving, Christmas, and New Years add an addittional 20% to weekly rate. There is an additional fee of $300.00 to heat the pool in the winter months.